Nicolay Netskar has been working at CSUSA since September 2017. 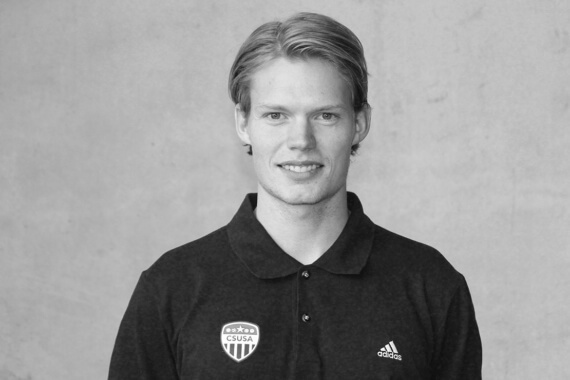 He is a Recruitment Specialist and works primarily with our Norwegian men’s soccer players out of our Oslo office. Nicolay Netskar started his college career at Wheeling Jesuit University in West Virginia in 2012. The school played in the West Virginia Athletic Conference (NCAA D2, now Mountain East Conference). In his first season, he was awarded WVIAC First-team All-Conference as the only freshman in the conference, and ECAC Division 2 All Star team. In his second year, he transferred to the University at Buffalo in New York, who is a part of the Mid-American Conference (NCAA D1). At UB, Nicolay played three seasons, and played in the Mid-American Conference Finals in 2015. During his time at Buffalo, he was awarded the MAC Presidential Award, MAC Distinguished Scholar Athlete, and MAC All-Academic Team. Nicolay also had the opportunity to play with the Seattle Sounders’ U23 team in the Premier Development League alongside some of the country’s most talented players, whom several of these are now currently playing in the MLS. While he was a part of the squad, the team won the PDL Western Conference Championship, and qualified for the National Playoffs Semifinal. Nicolay completed his bachelor degree in Business Administration with a concentration in International Business. He achieved a GPA of 3.9 (4.0 maximum), which resulted in him earning several academic awards. In his last semester, he did an internship with a company called CoachMePlus in Buffalo. Here he worked several teams from NFL, NHL, NBA, MLB, MLS, and several big NCAA programs. During his time at CoachMePlus he gained valuable insight on the business and sports science side of professional sports in America. After finishing his studies in the US, Nicolay had the chance to travel around to different clubs in Europe to trial with professional clubs in countries like England and Malta. Nicolay’s childhood club is Kolbotn IL, and he played for the first teams of Ullern and Drøbak/Frogn from 2010-2012. After finishing high school, Nicolay decided he wanted to experience USA and play soccer in a different country. After contacting CSUSA that helped him find a school and get a scholarship, he took the decision that the best way for him to keep playing soccer at a high level, while getting a quality education, was to attend college in the US. The best memory of my college career is when I played in the Mid-American Conference playoffs with my team University at Buffalo Men’s Soccer, in 2015. We were facing Western Michigan, a team which we lost to two weeks earlier, and we wanted to hit back with a win against our rivals. After 85 minutes of regulation WMU was up 1-0, but we managed to get a goal back and get to overtime. We won on a golden goal in OT and made it to the finals. The scenes after the goal were incredible and you could only imagine the energy in the locker room after. The final, which was my last college game as I was a senior at the time, was played in front of thousands of spectators against the national soccer powerhouse University of Akron. Unfortunately, we lost 1-0, but we played a good game and can be proud of our effort and resilience against a very strong side. I would also say that my experience playing for the Seattle Sounders U23 team in the Premier Development League is something I will never forget. To experience such a big MLS club from the inside is something unique that I learned a lot from. It was inspiring being part of an environment with players like Clint Dempsey and Obafemi Martins.